This is a PREVIEW of a PREMIUM video. To watch the entire video, click here. You don't have to start hitting it dramatically shorter just because you're getting older. In video 7 of the "Keys to RST" series, I will discuss the 3 contributing factors to club head speed... ▪ Rotation ▪ Width ▪ Leverage I will show you how to re-prioritize your swing around these 3 key components and I'll also let you in on a secret that will allow you to keep ALL of your speed OR get it back as you get older. Stop making excuses for your loss of distance and watch this video now! Rotation, leverage and width are your 3 key factors for clubhead speed. Learn how to use the 3 factors in a balanced way that will work for your swing. 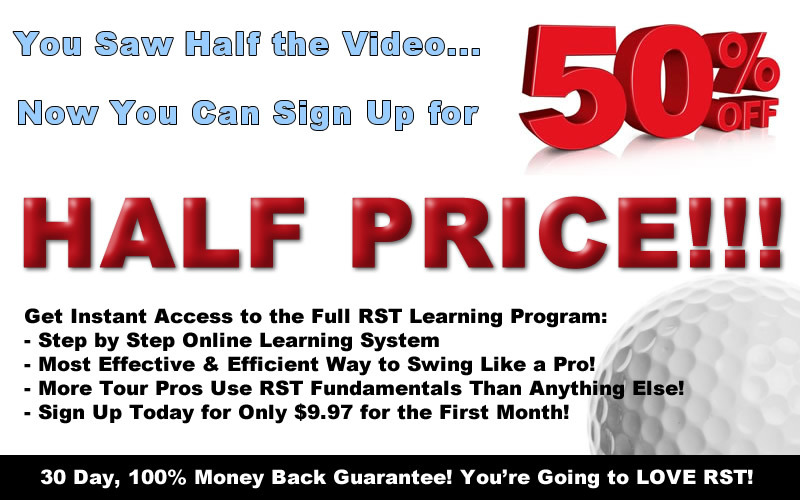 Over the first six videos in the "Keys to RST" series, we discuss how simple physics relate to the movements of the body in the golf swing. We discuss why so many golfers struggle producing lag, getting into a tour quality impact position and releasing the club properly through the hitting area. In this final video of the series called “Keeping speed as you get older”, I discuss the 3 key factors of clubhead speed. Rotation - This relates to the body rotation in the swing including the hips, the shoulders, torso, and the wrists. Width - The wideness of the swing in 3 dimensions that the club is swung on. The wider you make your swing, the longer the time the club has to accelerate. This can make the club a much longer tool and ultimately give you more leverage in the swing. Leverage is where a bulk of your club head speed will come from, making up nearly 60% of the speed during the release of the lag angle that you are producing in the downswing. As golfers start to get older, rotation becomes harder and harder to achieve in the golf swing. Rotation can cause deterioration of the body over time due to the shear force on the spine. With that said, we must look to the other 2 key factors of swing speed and learn how to produce as much width as possible so that you can in turn, produce more leverage. A great explanation of a wide swing shape very early on can be found in the “wide-narrow-wide swing shape” video. Many times we see older golfers trying to find ways to get all of their speed back with a longer more out of control swing that has tons over body rotation in it. This is just not the best solution at all. We can learn a safer and much more efficient way of doing things in the golf swing. My point is, you do not have to sacrifice a ton of speed in the swing and start hitting dramatically shorter on the course because you are getting older. We simply need to re-prioritize your swing in a way that will allow you to maintain speed as you get older. Speaking of, we actually did a video called “how to maintain your club head speed as you get older”, and our members started getting incredible results. We saw tons of students posting up amazing results and they were shocked that even well into their 70’s, they could still carry the ball 250+ yards off the tee. Click HERE to check that video out now and get all of your speed back and you too will be well on your way to bombing your driver! Hi. I'm Chuck Quinton, founder of Rotary Swing Golf. As we get older the tendency of course, is for us to lose a lot of distance. But I'm here to tell you, it doesn't have to be that way. Believe it or not, I have golfers who are in their 70's, who can still carry the ball 250 yards in the air, off the tee. That's because they understand one simple concept about the golf swing. And that is there are only three power sources. You have rotation, you have width, and you have leverage. I've talked about leverage a lot in this video series, because leverage is just really just our lag angle, what we're going to focus on. There's a lot of different leverages in the golf swing, but we're going to focus on the lag angle. That's the primary one. So when we're talking about leverage, we're really just talking about the angle between our forearm and the shaft, and as we have this, we have potential energy here as we release the wrist. That's leverage. Width is the wideness, in three dimensions, both going this way, and around this way in the golf swing. The wider you make your swing, the longer the club has time to accelerate. It does a bunch of things, it has more time to accelerate, and it also effectively makes the club a longer tool, giving you more leverage. So, if you swing really narrow, you set your wrists really narrow, really soon, and then you swing like this, you're going to have a really narrow swing. Your body's not going to turn very much, and that's going to take out rotation, which is the third part of the swing. As we rotate our bodies back, this is giving us torque, as our muscles are being loaded in our body, which is going to allow us to produce more power from our dump truck, what we talked about in the other video, getting our lower body to start everything. These three concepts just simply need to be blended together to produce a powerful gold swing. Now, as we get older, we tend to lose one of those. And that's really critical, because you've probably relied on it your entire golf career. And as you've gotten older, and we've lost a little bit of strength and flexibility, that one thing is catching up with you. But I promise you, if you take those other two parts of the equation, and put those into your swing, you're going to have tremendous amount of power, and probably even more than you had when you were younger. So to learn what that secret is, I want you to take a look at this video called How to Not Lose Clubhead Speed as You Get Older, and start pounding the ball off the tee. Hi, I'm Chuck Quinton, founder of Rotary Swing Golf. As we get older, the tendency of course is for us to lose a lot of distance, but I'm here to tell you it doesn't have to be that way. Believe it or not, I have golfers who are in their seventies who can still carry the ball 250 yards in the air off the tee, and it's because they understand one simple concept about the golf swing. That is, that there are only three power sources. You have rotation. You have width, and you have leverage. I've talked about leverage a lot in this video series because leverage is just really our lag angle, what we're going to focus on. There's a lot of different leverage in the golf swing, but we're going to focus on the lag angle because that's the primary one. When we're talking about leverage, we're really just talking about the angle between our forearm and the shaft. As we have this, we have potential energy here as we release the wrist. That's leverage. Width is the wideness in three dimensions both going this way and around this way in the golf swing. The wider you make your swing, the longer the club has time to accelerate. It does a bunch of things. It has more time to accelerate, and it also effectively makes the club a longer tool, giving you more leverage. If you swing really narrow, you set your wrists really narrow really soon, and then you swing like this, you're going to have a really narrow swing, your body's not going to turn very much, and that's going other take out rotation, which is the third part of the swing. As we rotate our bodies back, this is giving us [tork 00:01:29], as our muscles are being loaded in our body, which is going to allow us to produce more power from our dump truck, which we talked about in the other video. Getting our lower body to start everything. These three concepts just simply need to be blended together to produce a powerful golf swing. Now as we get older, we tend to lose one of those. That's really critical because you've probably relied on it your entire golf career. As you've gotten older, and we've lost a little bit of strength and flexibility, that one thing is catching up with you. But I promise you if you take those other two parts of the equation and put those into your swing, you're going to have tremendous amount of power and probably even more than you had when you were younger. To learn what that secret is, I want you to take a look at this video called how to not lose speed as you get older and start pounding the ball off the tee. Get Your Free Membership to Finish Watching "Keeping Clubhead Speed As You Get Older - 7 of 7 " Right Now!